So put your thinking caps on and let me know what your ideas are. I know I promised pictures of Taylor's room soon, but we had family over for dinner tonight so I didn't get a chance to take pictures of her room. 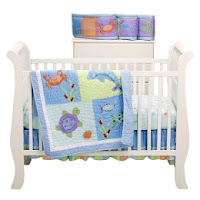 I am also still in the process of putting her crib bedding together and deciding on where I want the furniture. In the meantime you get to see me working on the crib. Keep checking back because I will have nursery pictures up at some point this week if the swelling will go down in my feet and allow me to do something other than sit with them propped up. Thank goodness that I can surf the internet with my feet up! Yes, that's right.... we have color! You are actually looking at the final purple color for the wall. The first purple color was too light and looked really washed out. My dear husband was SOOOO sweet and repainted the wall for me. I love the darker color! It looks so good with the green walls and I just love how it all turned out. I'm still getting used to having pastel paint in our house, but it is going to look so good with the white furniture. I've included pictures as you look around the room so that you can start to get an idea of how Taylor's room is coming together. 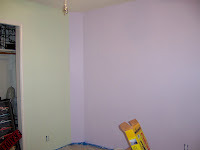 We painted three walls green and one wall purple. 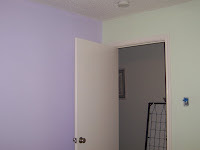 The purple wall is where the baby bed is going. Chris put the crib together tonight, so I hope to have more pictures up this week as all the furniture pieces are put in place. 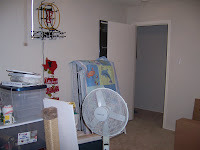 You can see that the closet is full of Taylor's stuff and some of the items that were still left in her room when Chris went to paint. Once I can start to put some of her items away our next big project is to put in a closet organization system. The soon-to-be grandmothers both suggested that we make better use of all the space we have in the closet. I have to point out that Chris has also replaced the blinds with nice faux wooden ones. He has been a busy little soon-to-be Daddy! Stay tuned for many updates this week as we work on Taylor's room. Not much time for stamping, but I have been working on crocheting a blanket for Taylor. I will try to scan one of the blocks tomorrow so that you can see! So our weekends and now even our weeknights are consumed with baby tasks. Saturday we spent the day registering at Babies R Us and then we went to Ikea to get furniture for Taylor's room. My brother and sister-in-law gave us their baby bed, so that was a BIG help and we finished out the rest of the room to match. After looking at several different places, the furniture at Ikea seemed like the best investment and it matched the crib the best. We got a dresser that we can put a changing pad at one end and all the diaper needs on top too. I want all those goodies within reach for fast diaper changes! We also thought this would be a good piece to last a while in her room. I even found little organization cubes and rectangles that fit inside the drawers to help divide it up. Chris thinks I'm such a dork, but I love organization and the fact that Ikea makes items the specifically fit the drawers! I can just see how much it will help for those little items like socks and hair bows. We also got a shelf to go above the dresser for decor items that we do not want Taylor to get her little hands on. We already have some little shoes that Chris' brother and his girlfriend brought the baby back from Germany to put on the shelf. I ca n't wait to start decorating. 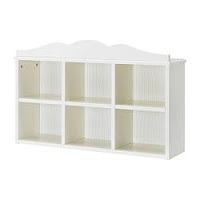 The last piece of furniture that we bought was a bookcase. I hope that since I keep having forgetful moments, that Taylor is gaining my brain cells and will need lots of shelf space for books. If she doesn't, then she can use it for toys. 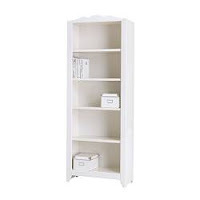 The bookcase has the same top design as the shelf and adds a girly touch to the room. 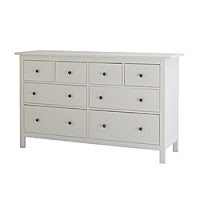 Just so you don't think I'm crazy with all this white furniture, we picked out the paint colors tonight. My scanner is not working right now, but I will try to scan the actual paint chips when I get the new one hooked up. In the meantime, imagine Stampin Up's Gable Green and a much much lighter Lavender Lace. We bought the paint tonight and Chris is going to paint a little bit on two walls tomorrow night so that we can see if we want 2 or 3 walls green. My mom is coming in town this weekend to help with decorating and planning for the nursery. Plus it's always nice to have my mom around! Just a couple pics of how Taylor's room is coming along, but there are still beer signs on the walls! Guess those will be coming down tomorrow night. 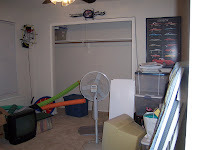 You will notice that I still have some items of mine to get out of there too! If you were to look around the floor, you would also find one of Sadie's toys. For some reason she likes to leave a toy in there. Wonder if that's a hint that she's okay sharing with the baby? 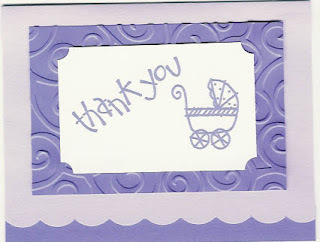 I just love the swirls background made with my Cuttlebug and the ticket corner punch. I had been making my own corner punch, but they were never the same size. It is much easier to do with the actual punch and worth every penny! I also had to add my own little touch to the back of the card with a stamp that I found at Amuse when I went to Seattle to visit Melinda. I find it even more appropriate now that I look more like the picture. 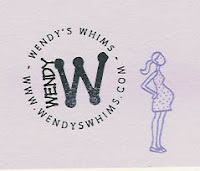 I always stamp the back of my cards with my 'Wendy's Whims' stamp, but just love the pregnant lady. Hope everyone enjoys my humor in this! Off to bed for me and the little one. I know, it must be a miracle that I'm posting again. 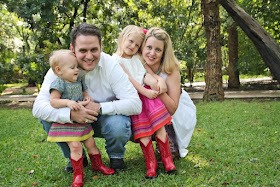 I just thought I would post about what has kept me so busy lately. Of course you know about my soon-to-be little one, but along with all the new daily adventures I've been working on getting her room ready. For some reason it was really easy for me to find boy themes that I liked, but just couldn't find a girl theme. It was also a challenge to find a theme that didn't scream pink! Chris is still adjusting to the idea of pink being everywhere. So after much stress and search we decided to do an 'Under the Sea' theme. I found the bedding at Target and it is too cute! I've included a picture so that you can see how cute it is too. The picture doesn't show, but the top of the quilt has a patch with an octopus and one with starfish. I will take pictures as we start to decorate her room, but for right now it still have a guest bed up, air hockey table in the closet(in pieces) and neon beer signs on the walls. This weekend will be a weekend of taking down signs and moving more stuff out. The crib is in there, just in pieces. 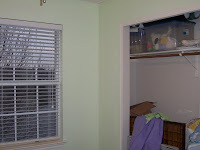 I think we are going to paint the walls lavender and light green, but I have to figure that one out too! Stay tuned for my nursery updates. Maybe in between all my theme picking I can find time for my stamps that have been calling my name!